The web page for this activity offers teaching tips. The datasets used in this visualization are specifically about Wisconsin, but the lesson can be applied to any region with ice-covered lakes. Furthermore, it might be useful as a case study of the effects of climate change on the Earth system. Interactive provides simple buttons that allow users to view the 10 longest seasons, the 10 shortest seasons and the overall trend. The records show significant year-to-year variability in the length of the ice-cover season, but there is a clear trend of fewer ice-cover days over time. In both lakes, the 10 longest ice cover winters were prior to 1905; the shortest ice cover seasons mainly fall in the last 20 years. This data illustrates the important point that although there is significant year-to-year variability, there also is an unmistakable trend in these data. There also are pop-ups that give the actual dates of ice cover and melting for each year. Data ends in 2010. 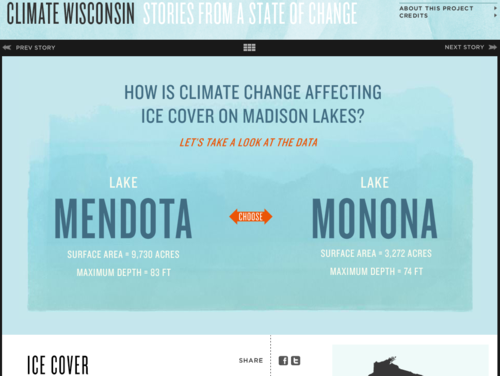 Up-to-date data can be accessed from the WI climatology office: [link http://www.aos.wisc.edu/~sco/lakes/Mendota-ice.html 'Mendota'] and [link http://www.aos.wisc.edu/~sco/lakes/Monona-ice.html 'Monona']. Comments from expert scientist: The resource provides a useful, easy-to-read historical record of ice cover for two well-known lakes in Madison, WI. The biological and limnological significance of changing ice cover on the lakes is explained accurately and at a level accessible to non-scientists. In each case, the science is accurate and accessible to anyone interested in understanding how climate change has affected Wisconsin. Very engaging data display that allows students to examine how the period of ice cover has changed over the decades. The main point of this visualization is to show that climate change is already happening, and the overall trend is toward significantly fewer ice covered days on these two lakes. The simple examination of these datasets opens up questions about the long-term implications for local culture and economy. There are additional examples on this website that explore other impacts of climate change and their implications. This data-driven visual can lead to a variety of questions. The technical quality of the graphical and the interactive features is very high.